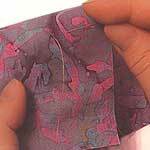 You can use any fabric that you can get a needle through. 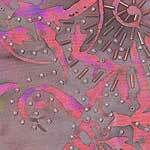 Bead embroidery has been around for generations and is highly valued in the haute couture fashion world. Amongst the most reknown wedding dress featuring beading on fabric is of course Princess Diana's wedding dress. Beads on fabrics look great not only on dresses, gowns and in fashion but also add that 'something extra' on bags, hats, shoes, belts, and even paper. In the illustration below on Beading on Fabric, we show a fabric that already has a design on it to further enhance it with bugle and seed beads. Often, combining beads with sequins really makes a fabric stand out. Small pearl beads adds tremendous value and distinction. Note: you can also use the same techniques for Bead Embroidery on Paper. 1) Thread the beading needle with about 1 meter of beading thread. Tie a knot at the other end of the thread. Thread the needle through the fabric, back to front, where you want to position the first bead. 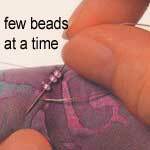 2) Thread your first bead. Push the needle back through the fabric, front to back, slightly further along from where the thread came up and towards where you want the second bead. This spacing (between the in and out of the needle on the fabric) should be far enough to allow the bead to sit nicely on the fabric. 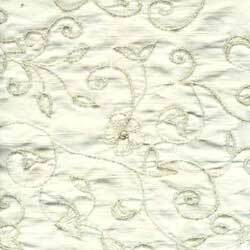 Continue to embellish the fabric in this way till your are happy with the look. to create areas of beadwork, you need to finish the thread off in one area and start a new threading at the next beadwork area.